Urban LA County back drop. As the main sales person for sinister brand, Ed Soares began to see the potential for the brand and eventually was given the opportunity of buying the company. Ed jumped at the chance of a lifetime and immediately began adjusting the brand to how he thought it was portrayed. For some time, it stayed as a nightlife party style brand, and was featured in some larger retail stores (and also boutiques). While the brand was taking off, Ed got involved in mixed martial arts and Jiu Jitsu by training with and sponsoring athletes. That is where the Sinister Brand -- as most people know it -- began. Sinister Brand began its new approach with launching a new website, with new content and layout. This time around, it was the new crop of talent Sinister Brand was able to work with that plagued the front page, because of Ed's growing position as a fight manager for MMA fighters. During this period, fighters (with big names like Chuck Liddell and Rampage Jackson had the horned "S" on their shorts, as well as soon to be upcoming stars like Anderson Silva, and Lyoto Machida. Sales, at Sinister's peak in 2008, blew out of the roof. Inventory could not stay on the shelves. The success was a dual-pronged effort of both guerrilla marketing, and the success of the athletes endorsed by Sinister. The fact that Sinister had been involved in private label since the beginning also gave us an edge when we developed fight specific attire -- namely fight shorts and rash guards. Sinister was able to very quickly grow at a perfect time when new talent and originals began to win big high-profile bouts at the time this MMA sport was also growing exponentially. Some would say it was a perfect storm. Fighters that were given U.S. identities were: Anderson Silva, Lyoto Machida, and Big Nog "Minatauro Nogueira. Sinister pioneered the athlete endorsed shirts for old school originals such as Jens Pulver. Lyoto Machida was actually known as Ryoto because of the Japanese crowd, but then got his nick name "The Dragon" while sponsored by Sinister. Since then, every MMA company has utilized the practice of endorsing. If you look at old UFC events you will see the Sinister Brand logo on the cage. If you look at old Pride footage, you can see the horned "S" all over the place on fighters. When Royce Gracie fought Matt Hughes he was wearing the Sinister horned "S". Sinister has been a part of MMA from every angle encompassing production, marketing, sponsorship, brand sales, and over all consultation. If you look at the competition now you can see all the traits of Sinister Brand's influence. 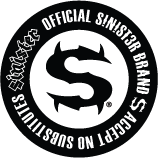 Sinister Brand is known worldwide, at one time having accounts in: Europe, Australia, South Africa, Brazil, Mexico, Canada, and even Japan.